Pamper your sister more than ever with some exclusively designed personalized gifts for her from the house of Dezains. Be it your elder, younger or even your twin sister, surprise her with wonderful gifts and express your deepest emotions for her. The numerous kind of gift items are one of their kind, each having a story of its own. Are you up for a unique story of yours and your sister with Dezains? Here are the 5 best gifts to give your sister this year and make her feel like the perfect princess of the day. Caricature T-Shirt for Sister – Do you enjoy cracking a joke or two on your sister? And she equally laughs it off? Then, you have found the perfect match for her! This hilariously painted caricature t-shirt is a complete side splitting attire which your sister simply cannot complain of. Featuring a caricature picture of your sister, this t-shirt is the best gift to give your sister and make her stand out in the crowd. The comical hand drawn image will creatively bring out your sister’s personality. Customized Cushions – The perfect way of letting your sister break free from her work stress! These customized cushions are absolutely the best gifts to give your sister this year, especially when she has had a rough day at work. The soft comfortable feel of the cushions is complemented by the customized pictures of your sister on them. The cushions can be customized with a special message for the sister to let her know that you care. The vibrant color combination just makes them elegant additions in the living room. Personalized Mugs – A special gift for a special person! If you’re elder sister is more of a coffee person, then this personalized mug is the best gift to give your sister this year. The innovative designs along with interesting artwork on the mug not only gives it a personal touch but makes it an attractive one. The coffee mugs can also be personalized with a charming picture of your sister or the siblings which will always remind her of the heartfelt memories you have shared together. Personalized Photo Canvas – A special gift which is worth cherishing for years! Surprise your sister with this adorably designed personalized photo canvas which features her favorite moment. The best gift to give your sister this year, the personalized photo canvas is procured from durable material which can be easily adorned in the living room. 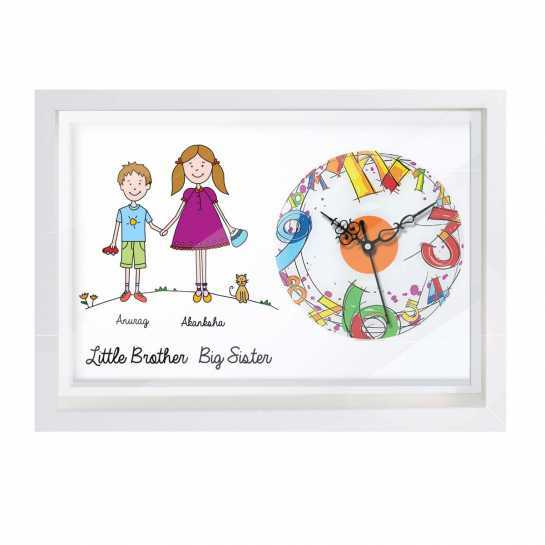 The personalized image of your sister along with a special message for her will make this gift a memorable one for her. Customized Beer Mug – If your elder sister chugs down her beer in style, then this is the best gift to give your sister this year. With this customized beer mug which comes with special designs and artwork, you are sure going to let her enjoy her drink seamlessly. The transparent design along with exquisite engraved message adds a chic touch to the beer mug.